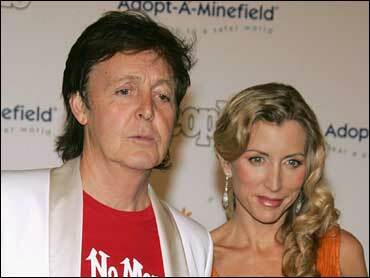 Did Paul McCartney Lock Out Heather? A security guard at Paul McCartney's London home called police when one of his estranged wife's guards climbed a wall to let her in, a spokesman for Heather Mills McCartney said Tuesday. Mills McCartney's security guard climbed a wall to open a gate after realizing the locks at the home had been changed, her spokesman Phil Hall said. A guard inside called police, who spoke to Mills McCartney and left, Hall said. Mills McCartney then entered the house with the couple's daughter, Beatrice, 2, and stayed the night, he said. Hall played down the incident, which comes in the midst of what the British media says are acrimonious divorce proceedings between Mills McCartney and the former Beatle. "She said it was hilarious. It was just a complete mix-up," Hall said. Stuart Bell, a spokesman for McCartney, declined to comment. Hall said McCartney had frozen the couple's joint bank account and sent Mills McCartney a letter complaining about three bottles of cleaning liquid that were taken from his home to her office. London's Metropolitan Police said they were called Monday evening to reports of a suspect on the premises of a northwest London home but would not say whether it was McCartney's. Officers spoke to a woman but no offenses were found to have been committed, police said.